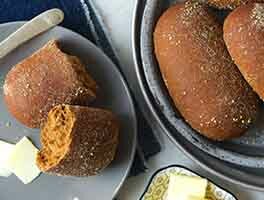 When you think sourdough bread, you probably think an artisan loaf, one with a thick, chewy crust and coarse interior. 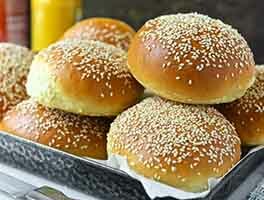 These soft dinner rolls are at the opposite end of the texture spectrum. Buttery spirals with a pleasingly mild sourdough tang, they're soft on the inside, but sport a wonderfully crisp crust — think crescent roll. 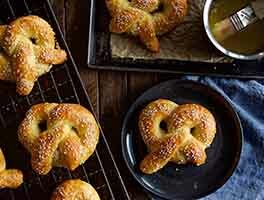 And, like a crescent roll, they're fun to unravel and enjoy bit by buttery bit! 3 hrs 42 mins. to 4 hrs 55 mins. Place the dough in a lightly greased container — an 8-cup measure works well here — and allow the dough to rise for 1 1/2 to 2 hours, until it's just about doubled in bulk. Roll and pat the dough into a rough rectangle approximately 12" x 16". Put 2 tablespoons melted butter in a small bowl, and add the paprika, if desired; it's there for color, and accentuates the buns' swirl, but omit it if you wish. Spread the dough with the melted butter. Cut the log in 1" slices, using a sharp knife, or a piece of dental floss looped between your fingers. Lightly grease two 8" or 9" round cake pans. Arrange 8 buns in each pan. 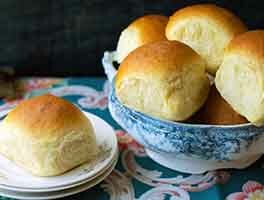 You'll notice these buns don't brown as deeply as most dinner rolls — how come? Typically long rising, sourdough affects browning by changing the pH of the bun, as well as consuming the sugar that would otherwise caramelize (brown) on the bun's surface. These bake up just fine. I found the flavor and texture to be just ok. I was hoping to love them, but we didn't. I didn't think the sourdough added that much flavor, at least, I was expecting more. These clearly seem to be well loved from the reviews, but they didn't cut it for me. These just came out of the oven and I gobbled 2 before they finished letting off steam! I followed a couple of the recommendations and turned these into cinnamon rolls. Perfect! The dough wasn't too sweet and I know I'll tweek the filling amounts when I make these again. I also love the idea of using herb butters in this recipe. Because I'm always trying to find new recipes for discard, this is a great base for experimentation. I put one of the pans in the fridge to retard the last rise and I'll bake those up tomorrow morning. Can't wait to compare the two pans. Made these into cinnamon rolls, liked that the dough was not so heavy and just filled with brown sugar and cinnamon. New go to! Beginner sourdough baker, hated tossing the discard so I tried this recipe and what a surprising outcome! 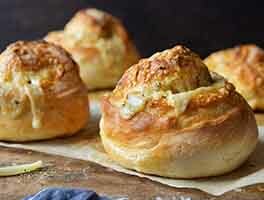 Great dinner rolls, and also perfect size for a snack sandwich! Loved the paprika to outline the swirls! Definitely a make again and again! Opps the recipe called for 2/3 cup water not two. Turned out great but mine were much denser then the batch my mother in law made. What causes that? Very doughy - after weighing dough in two equal parts, I made 8 rolls in round pan as recipe called for and in the other made 12 rolls. The smaller rolls, even though an error on my part, were better. They tasted cooked, warmed much better. Pan made per recipe - tasted under cooked, and we were after a crunchy outside and a nice tender chewy inside. These left us blah! I agree with others who say that this is a very versatile recipe. I divided my dough in half. I made half with honey butter to serve with soup. The other half I made with maple butter inside and maple glaze applied after baking for dessert (& breakfast the next day). I look forward to trying herb butter and/or cheese the next time I make this recipe. I brushed the rolls with butter before baking and they browned up nicely. I made my own starter 2 years ago and have been baking bread and rolls with it ever since. I'm getting better at it as I go along. 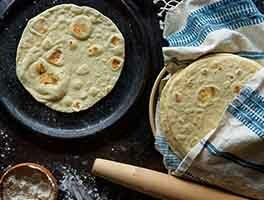 This recipe is fantastic, you can play with ingredients, if you have time for a long slow rise, you can use starter only, if you dont have the time you can add yeast. I've never needed more than 1 teaspoon though. I just made my third batch, seems like you just can't mess up, they come out great every time. This time I put cinnamon /sugar on one half, gonna have to play with my cinnamon mixture a little, but they are tasty!